Yoga, to those who have not yet experienced the magic, can appear daunting. Did we not all feel this way, when we first started our journey? Who, when they stepped across the threshold of their very first yoga class, thought ‘I am ready for the trials, tribulations, energy and sometimes painful personal development that following a yogic path involves.’ I would bet on that the people with that mentality are very few — and if you know one of them, please connect me to them, because I have questions! If you have studied yoga, you already know that this guide to life exists — and has existed for thousands of years! Thanks to Patanjali, a sage from nearly 1,700 years ago, who wrote down what we know today as the yoga sutras; 195 aphorisms that aim to spread the wisdom and insight learned from the path of meditation and yoga, as it was [as still is today] understood. Written originally in Sanskrit, there have been many translations over the years, but as one can imagine many are lengthy, dense and unavailable to the casual practitioner. Who says happiness has to be reserved for people who devote every single aspect of their lives to the practice? That’s where Amy Peace-Hayden and Kelly DiNardo come in. As mentioned, there are plenty of Yoga Sutras translations and commentaries for those driven enough to seek it. But for those who are starting on their path, or do not have a guru to help guide them through the twists and turns of this endless adventure, there is a new tool. 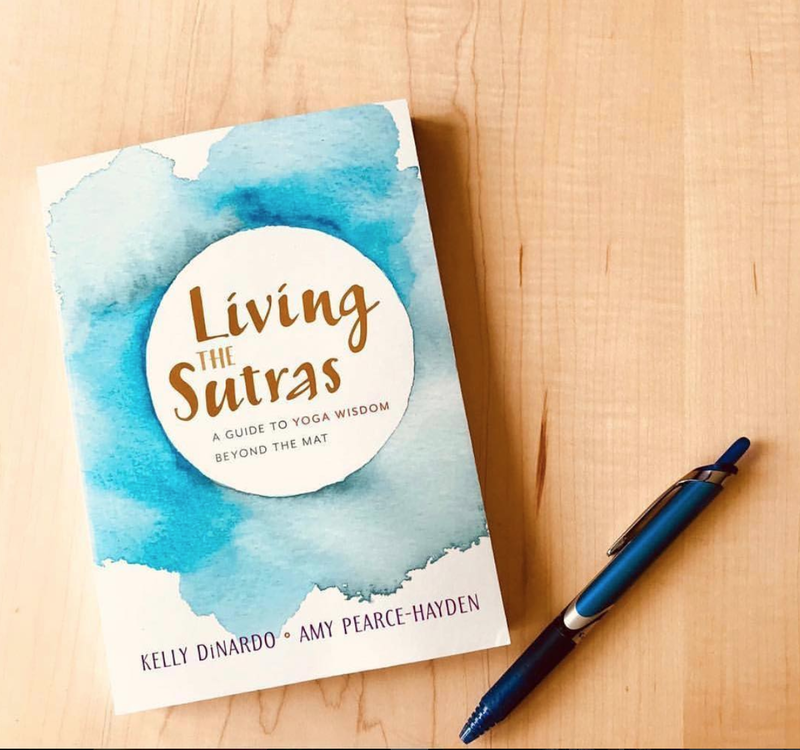 Amy and Kelly’s new book, Living the Sutras: A Guide to Yoga Wisdom beyond the Mat, is an introduction to the classic philosophy that, for ages, has driven positive change personally and within society as a whole. The power to change our lives is real and harnessable, if you know how to find it and how to best utilize it. These two women, who have spent a lifetime studying yogic practices and instilling these ideas into their every day life, have broken it all down for us. Their book is written in a way that most books about the yoga sutras are not. They approach these complex ideas with humility and grace — in an understanding, empathetic voice that is reminiscent of Lord Krishna from the Bhagavad Gita. In fact, this book grew from conversations regarding the sutras that passed forth between Amy and Kelly upon Kelly’s initial learning of the sutras. From this, the two women have chosen to focus primarily on the first two books of the sutras, which provide the foundation for an understanding of a conscious life and self-study (svadhyaya). Their writing is unique in that is provides a modern understanding and interpretation of age-old lessons, from dealing with loss and pain to cultivating joy and contentment. They provide concise lessons, written in a language that is available and understandable; and when you reach the end, you are rewarded with a translations of the sutras, simple and without commentary. Not only do your receive value from Amy and Kelly’s list of actionable items and thought-provoking points, but you’re able to read through the sutras in their entirety and see how they relate not only to you, but how they relate to one another. Thought the sutras are insightful and digestible one by one, their true impact lies in their interwoven nature. Living The Sutras is a book that has many uses. It can be read as a whole, or in pieces. It can be used as a relaxing read, or for vigorous study and practice. It can be used by teachers, students and not-so-students alike. It is a book that is multi-faceted and, having read several iterations of Patanjali’s Sutras, the one that I found the one to be the most digestible and the most memorable. If you are planning on reading this text, prepare to leave the experience changed and excited to continue your studies as a student of life itself. 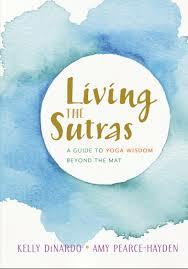 Buy Living The Sutras on Amazon!